Little Dancer, a musical inspired by the young ballet student who posed for Edgar Degas’ enigmatic sculpture, Petite Danseuse de Quatorze Ans, has opened at the Eisenhower Theater, John F Kennedy Center for the Performing Arts, in Washington DC. This world premiere production, based on fact, but partly fictionalized, tells the story of young Marie Genviève van Goethen, one of les petits rats – the name given to the young students of the Paris Opéra Ballet – whom Degas selected to pose for a sculpture which became one of the most famous in the world. Presented at the Sixth Impressionist Exhibition in Paris in the spring of 1881, Petite Danseuse was the only sculpture which Degas would ever exhibit publicly, and it was never shown again. With book and lyrics by Tony Award® winner Lynn Ahrens, music by Tony Award® winner Stephen Flaherty, and direction and choreography by five-time Tony Award® winner Susan Stroman, the musical features an equally impressive cast. 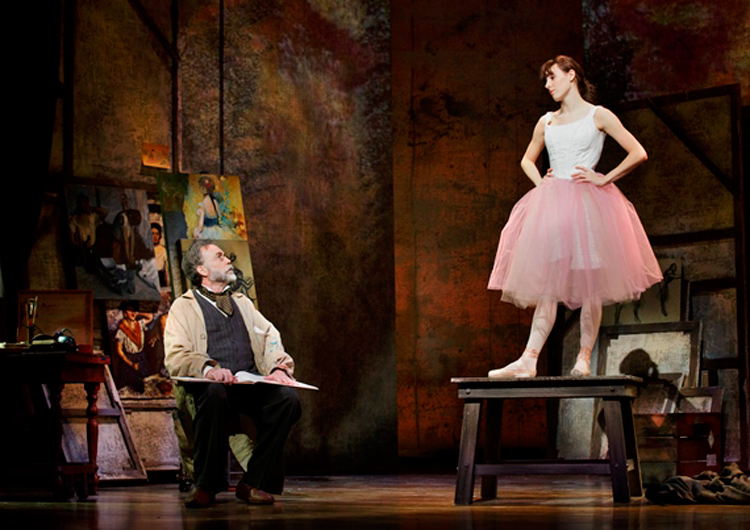 It includes four-time Tony Award® winner Boyd Gaines as Edgar Degas, three-time Tony Award® nominee Rebecca Luker as the adult Marie van Goethem, and New York City Ballet principal dancer, Tiler Peck, as the young Marie van Goethem. The production portrays Marie as a young girl in 19th-century Paris, struggling to maintain her place in the corps de ballet of the Paris Opéra, keenly aware of her family’s poverty and lowly position, and her debt to the artists, yet also on the verge of womanhood, and – as the program notes say – “caught between the conflicting demands of life and art”. The story is told in flashback format, in which the adult Marie van Goethem, haunted by her memories, recalls how her life of hardship was forever changed by a chance meeting, from which she emerged as “the most famous dancer in the world”. Susan Stroman told Amy Henderson (Smithsonian Magazine) that the idea for this production struck her when she was in Paris, and saw a bronze casting of the sculpture at the Musée d’Orsay. 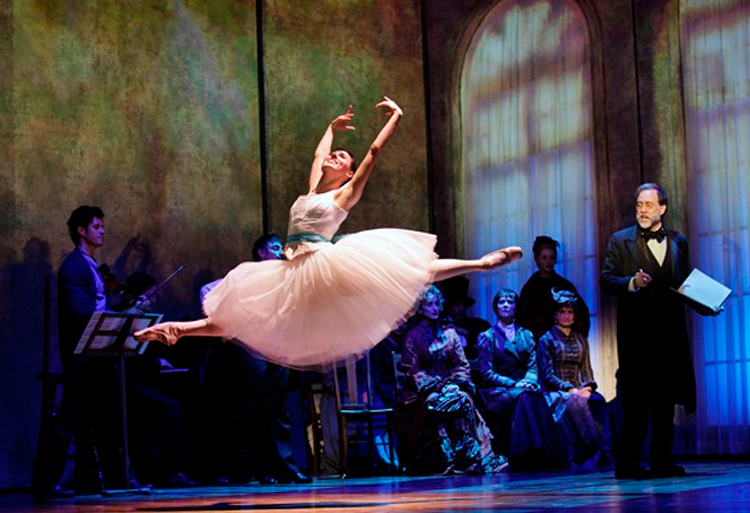 “The young girl is posed in a relaxed version of ballet’s fourth position,” writes Henderson, “but there was something about her attitude—the thrust of her chin, the way she held her body—that made Stroman want to know more.” Returning to New York, Stroman met with Lynn Ahrens and Stephen Flaherty (1998 Tony Award-winners for Ragtime), and they needed no persuading to consider a musical based on Marie’s story. The real-life Marie did indeed come from a working-class family. Her father was a Belgian tailor, her mother a laundress, and she was typical of many of the students of the Paris Opéra ballet school – young and pretty, but poor, and therefore at the mercy of potential male ‘protectors’. She certainly caught the eye of Degas who was said to have spent many hours in the studios and backstage world of the Opéra, painting and sketching the dancers as they rehearsed or stood in the wings. According to Paul Trachtman (Smithsonian Magazine), though, “Degas enjoyed the company of these dancers, who shared gossip with him as they posed, but his affection for them was paternal”. He created his Petite Danseuse sculpture in pigmented beeswax, using real hair, tied back with a silk and linen ribbon, a cotton and silk tutu, and linen ballet ballet slippers. Much has been written about the reception with which this sculpture was greeted – “repulsive”, “a flower of the gutter”. Critics raged over its “appalling ugliness” – although some saw in it a “blossoming”. (www.edgar-degas.org). There’s no denying, however, that Degas captured the innate elegance of the dancer, even though the hands clasped behind her back, the somewhat defiant angle of her chin and the almost rebellious expression on her face appear to portray a degree of unwillingness to pose for him. Perhaps she was, as it has been suggested, in debt to him. Marie was forced to leave the Opéra a few years after the sculpture had been created, having been dismissed for poor attendance in class. She was reportedly seen frequenting various taverns which were deemed undesirable places for a young girl, but ultimately – as enigmatic as the sculpture which she inspired – she disappeared without trace. 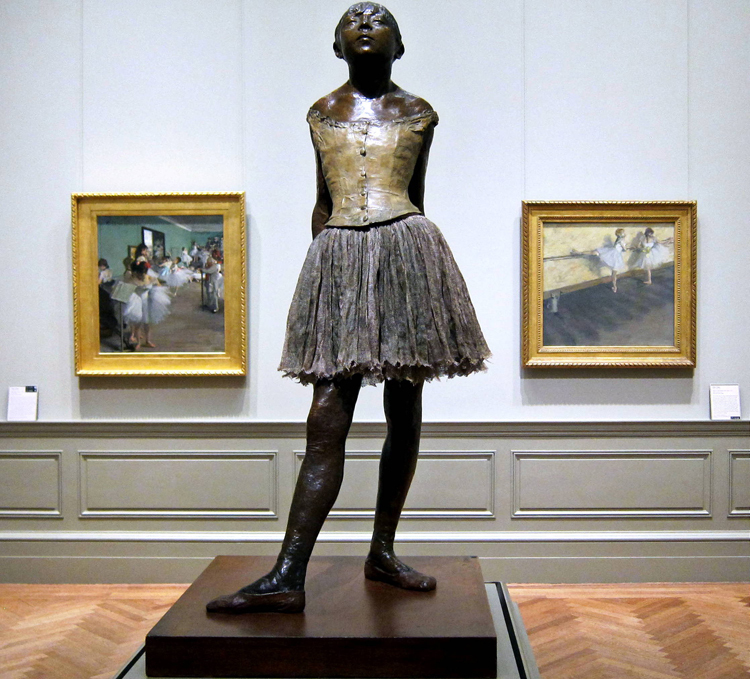 The original beeswax version of Petite Danseuse de Quatorze Ans is held by the National Gallery of Art in Washington DC, which has the largest and most important collection of Degas’ surviving original wax sculptures in the world. Petite Danseuse forms the centerpiece of the current exhibition – entitled Degas’s Little Dancer – an exploration of his fascination with ballet and his experimental, modern approach to his work, which is running concurrently with the production of the musical. 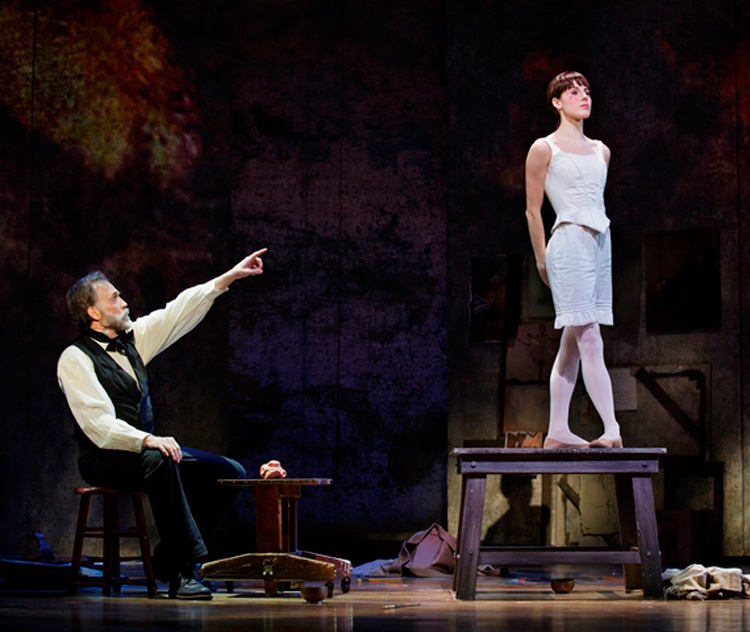 The creative team of Little Dancer includes set design by Beowulf Boritt, costume design by William Ivey Long, lighting design by Ken Billington, sound design by Kai Harada, music supervision by David Loud, dance arrangements by Sam Davis, orchestrations by Doug Besterman and Larry Hochman, wig and hair design by Paul Huntley, and projection design by Benjamin Pearcy. Shawn Gough will conduct the Kennedy Center Opera House Orchestra. 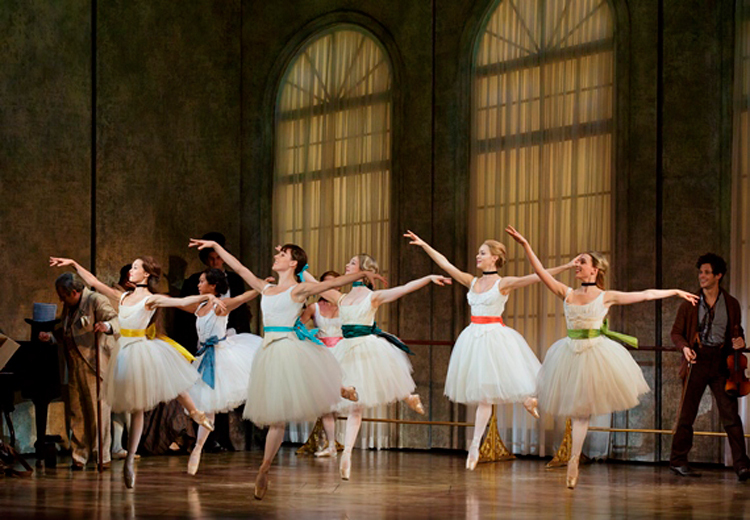 The Kennedy Center’s production of Little Dancer can be seen at the Eisenhower Theater through November 30, 2014. The exhibition, Degas’s Little Dancer, is on view from through January 11, 2015 at the National Gallery of Art. View a montage of scenes from the production via this link, and a clip from the opening number here.